For several decades, this was the most prominent tower on the Upper East Side and, with its peaked roof, the gilden crown of which is a discrete, working chimney, it is a major Art Deco landmark. The 40-story, yellow brick and limestone building was completed in 1930 and 187 of its units were converted to cooperative apartments in 1970. Its residents have included famous automobile magnates and oil company executives and the hotel's guests have included President John F. Kennedy. Over the years, the tower has been modified somewhat to accommodate the desires of some residents for large picture or bay windows with the result that it is appearance is most irregular, but not marred and in fact quite interesting for its modern "carbuncles." The building was designed by Bien & Prince and actually consists of two buildings occupying the entire blockfront on Madison Avenue between 76th and 77th Streets that are so skillfully joined that most people are not aware that they are separate. 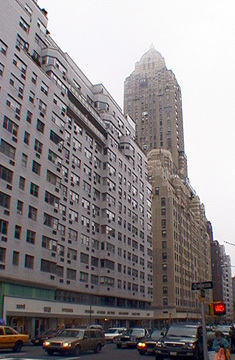 The "hotel" is the tower on the south side of the frontage and the second building is a 17-story apartment house with an entrance at 50 East 77th Street that appears to be part of the base of the setback "hotel" tower. "The Carlyle's tower, said to be inspired by John Francis Bentley's Byzantine-style Westminister Cathedral in London, although Bertram Grosvenor Goodhue's more abstract integrations of Roman and Byzantine sources seem more clearly evident as an influence, became the symbolic campanile for the most fashionable district of the Upper East Side," wrote Robert A. M. Stern, Gregory Gilmartin and Thomas Mellins in their fine book, "New York 1930, Architecture and Urbanism Between The Two World Wars," (Rizzoli International, 1987). "There is a fine, sweeping vigor in the [tower's] shaft, which sets back at the top simply and gracefully to an octagonal tile roof capped by a gilded element that looks like a gigantic screw-plug for an electrical light connection," observed T-Square, an architectural journal, shortly after its completion. It is the proportions of the rather slender tower that make it so successful. It was built only a few years after Harvey Wiley Corbett's great apartment towers at One Fifth Avenue and Riverside Drive and 103rd Streets and Emery Roth's great Ritz Tower on Park Avenue at 57th Street that established the skyscraper luxury apartment house type. 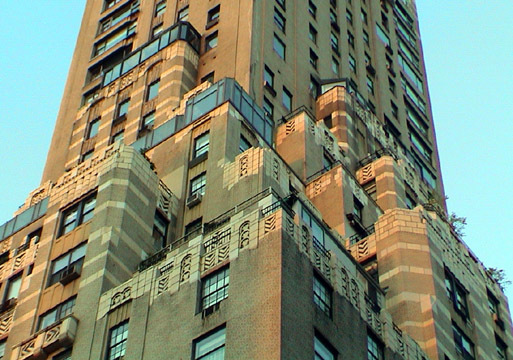 Emery Roth would soon design more such as the great San Remo and Beresford multi-towered apartment buildings on Central Park West. It is interesting that the Carlyle has survived in splendid isolation that has heightened its visibility in comparison with most of these other pioneering residential towers. Much of the credit for that must go to Peter Sharp, the late developer who bought the hotel and also owned the low-rise building that fills the avenue blockfront across the street. That building was for many years the headquarters of Parke-Bernet, the auction house that was subsequently acquired by Sotheby's, which proceeded to relocate it to a warehouse-like building on 72nd Street and York Avenue. After World War II, Parke-Bernet was the center of the art world and largely responsible for many art galleries moving uptown around Madison Avenue from 57th Street. Sharp could have erected a very major new tower on the site after the auction house was moved, but he chose to not develop it and protect the sweeping and stupendous Central Park views for the Carlyle. The low-rise building now contains several important art galleries and some offices of the real estate division of Sotheby's as well as some high-end boutiques. Sharp, whose mother was a major art collector, also installed planters on poles on the sidewalks in front of the buildings on both sides of the avenue on the block. 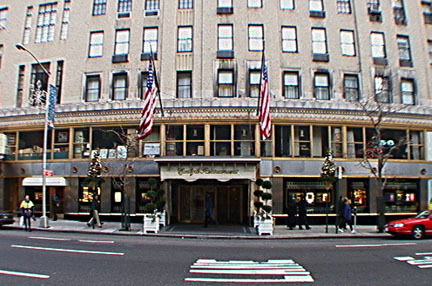 The Carlyle's retail frontage on the avenue is highlighted by stainless steel columns and the center of the frontage has an entrance to its famous bar decorated with murals by Ludwig Bemelmans and its nightclub where singer Bobby Short has been the lead attraction for decades. The entrance to the hotel and tower apartments is brightly lit and attractively formal and the hotel has a medium-size ballroom on the second floor. Its very attractive, double-height dining room is the city's most attractive "power breakfast" site. The hotel has always been one of the city's most elegant and most expensive. Although its apartments are not huge, they have stupendous views and all the service that a major luxury hotel can muster. The detailing of the Carlyle is very fine as can be seen in the photograph above, and in the first-floor picture "frames" on the sidestreet and the nice scalloping of the bandcourse above the second floor.